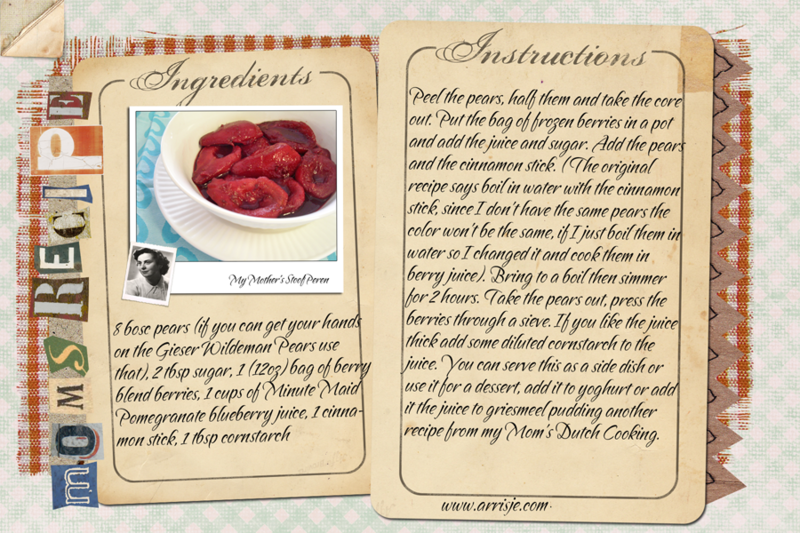 It is about time I start to post some recipes of my child hood. Recipes of the food my mother used to cook for us and still does. The picture below shows some shots of her well used cookbook :). If you are Dutch you know what this is. This is a typical Dutch dish. I had to improvise with this recipe for stoofpeertjes, because some ingredients are not available here, like ‘Gieser Wildeman Pears’, I used Bosc Pears. Bosbessensap is not available here neither. I came up with one of my own concoctions. Peel the pears, half them and take the core out. Put the bag of frozen berries in a pot and add the juice and sugar. Add the pears and the cinnamon stick. 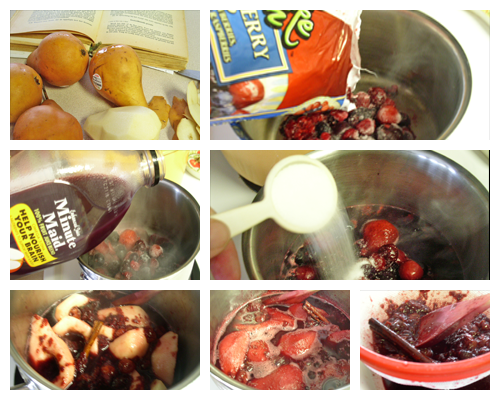 ( The original recipe says boil in water with the cinnamon stick, since I don’t have the same pears the color won’t be the same, if I just boil them in water so I changed it and cook them in berry juice). Bring to a boil then simmer for 2 hours. Take the pears out, press the berries through a sieve. If you like the juice thick add some diluted cornstarch to the juice. You can serve this as a side dish or use it for a dessert, add it to yoghurt or add the juice to griesmeel pudding another recipe from my Mom’s Dutch Cooking. Peel the pears, half them and take the core out. Put the bag of frozen berries in a pot and add the juice and sugar. Add the pears and the cinnamon stick. ( The original recipe says boil in water with the cinnamon stick, since I don't have the same pears the color won't be the same, if I just boil them in water so I changed it and cook them in berry juice). Bring to a boil then simmer for 2 hours. Take the pears out, press the berries through a sieve. If you like the juice thick add some diluted cornstarch to the juice. You can serve this as a side dish or use it for a dessert, add it to yoghurt or add the juice to griesmeel pudding another recipe from my Mom's Dutch Cooking. 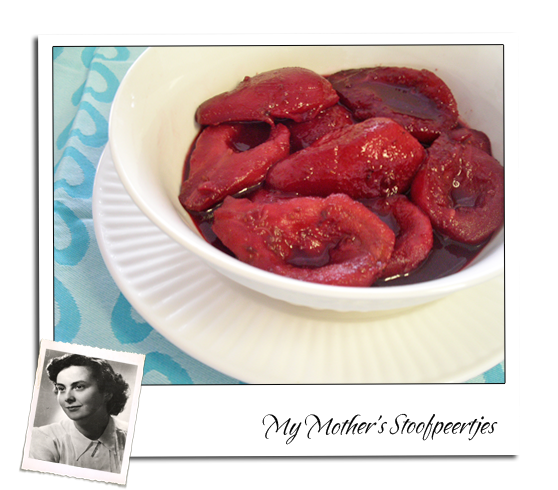 Love this recipe for stewed pears. My family in a Holland uses any red wine instead of juice to simmer them in.